Japan was not a very enjoyable place to live immediately after the war. Having narrowly staved off famine and slowly rebuilding under the American administration, for the children of the country life was fairly bleak. And then someone created the Hibari-go for them, an idea that roughly translates as Skylark. 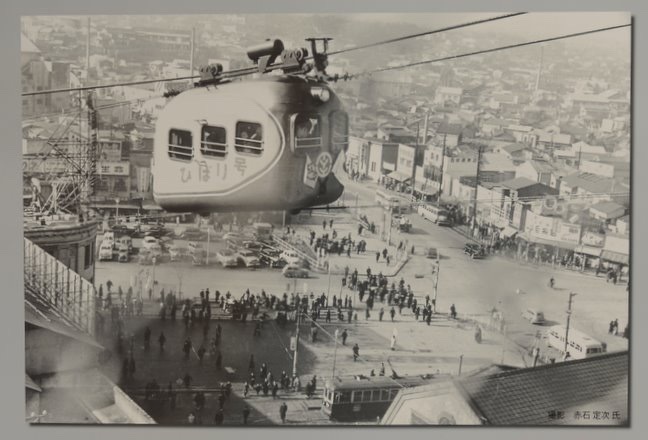 In 1951 an airborne cable-car ran from the rooftops of the Toyoko Building (Tokyu Bunka Kaikan, which later housed the Shibuya planetarium), to the Tamaden Building, a hundred meters away. Under its operating licence, the cable-car was not allowed to actually provide transport facilities and so the trip was a round-robin back to the start, the doors remaining firmly closed. Up to twelve children could ride at any one time, gaining a bird's eye view of the rapidly rising city, which had been flattened by years of war. But the question has to be asked, why build a cable-car, especially one that is purely for sight-seeing and only for children, in a time of extreme austerity and reconstruction? In the late 1980's, I once briefly worked on a company that had been created post war in Allied occupied Germany. The founder had realised that, if he accumulated all the possible grants available at the time, he could build bowling-alleys and have the Allies pay for them, the money available being greater than the actual cost of construction. It's interesting to note that the Hibari-go only operated for a year and a half, closing in 1952; the year America pulled out of Japan. But whatever the reason it was created, it must have given the children of Shibuya quite something of a ride to remember. All aboard the Skylark!